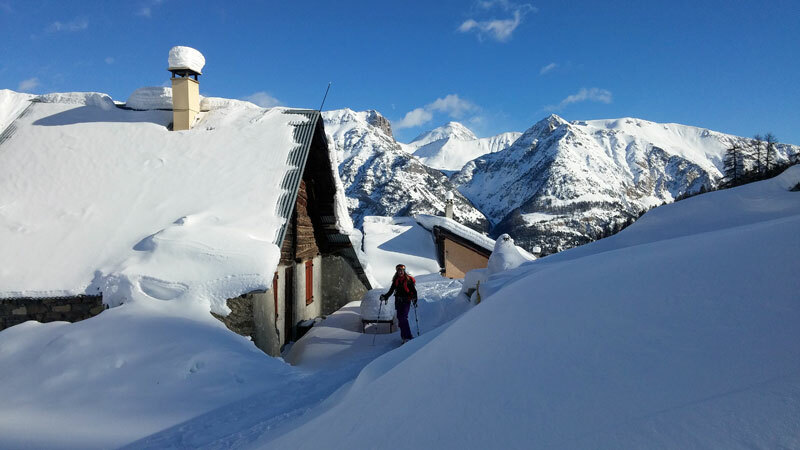 After something of a snow drought for the holidays in December, the snow gods awake and it's finally winter in the Alps with picture postcard snow-covered resorts . But they nod off again as the sun arrives for an untimely spring and it's more like the Med as the deckchairs come out. Finally! The forecasts are showing snow from tomorrow. 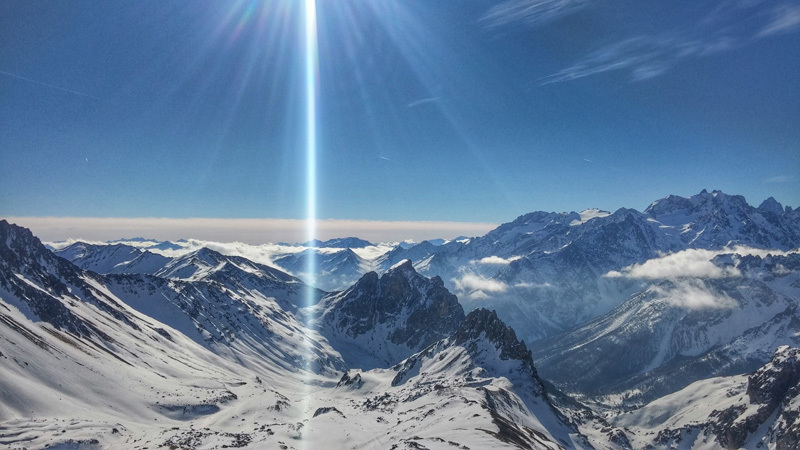 While, this week, the families out on the mountain can't complain about the sun, resorts all over the Alps will be breathing a sigh of relief that the snow gods have finally stirred. The blissful sound of snow ploughs in the morning - and a sight for sore eyes. Snow. It started around 21:30 last night and has not stopped, probably around 20-25cms as you can see on the bird table and van. And it's still coming down, though only lightly now. I can hear they are blasting up top which bodes well that they might be opening up some more sectors, though I don't think there's too much of a rush for first lifts. We have to dig the van out first! 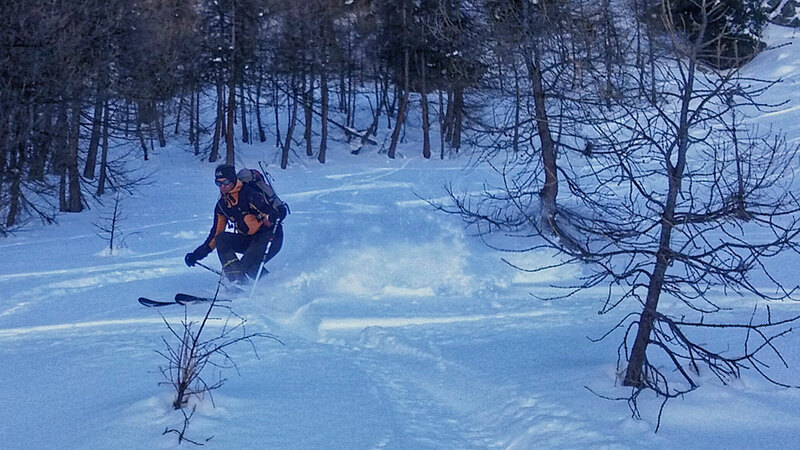 Yesterday, I wanted to stretch my legs and those of the Rando Chiens by ski touring up to the Col de la Cucumelle, some 1,200m vertical. As I arrived at the top I managed a rather unique selfie via the Cucumelle webcam! 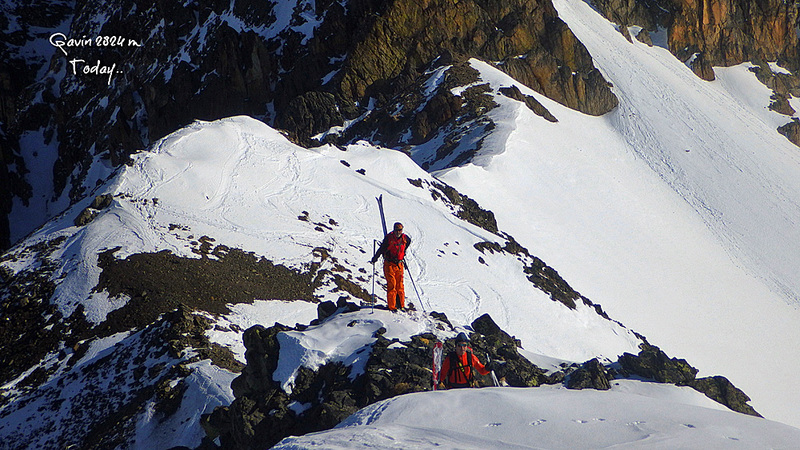 Descent was not too good with a very varied snow pack on the upper slopes and rocks a plenty lower down, but still managed to lay the first tracks of the season. So yesterday and today we've commuted to our office on the 9 o'clock - first chairlift. Still half of the resort is closed so there're a few Club Med and UCPA elbows to avoid in the mountain rush hour. 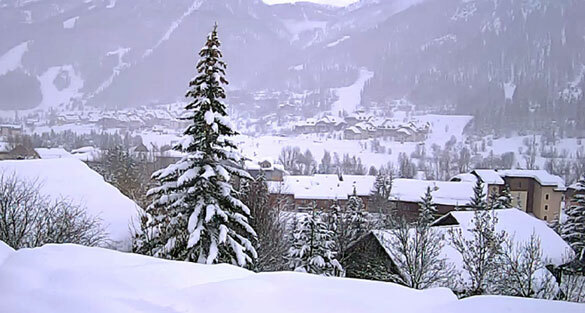 The resort now looks like a picture postcard and the off piste appears glorious. Until you go to shred it and start shredding your skis on rocks, tree stumps and gulleys! Not that it stops Gav. 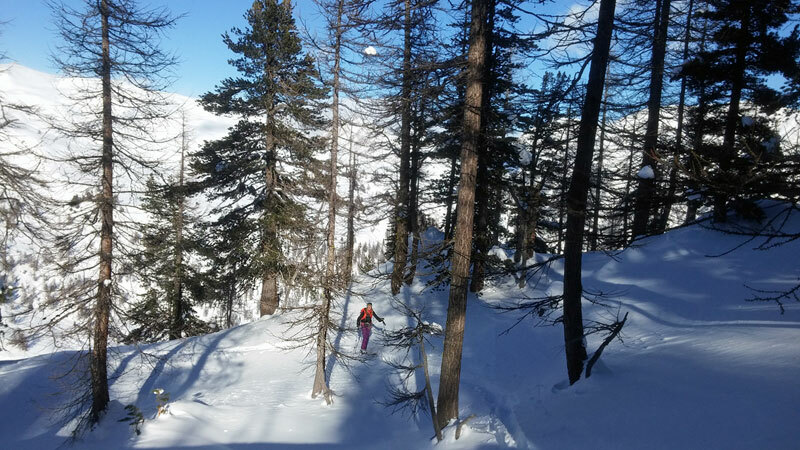 But, hey, it's better than a poke in the eye with a sharp stick - which I can vouch for, having had a poke in the eye with a few sharp sticks on the way down through the off piste trees! 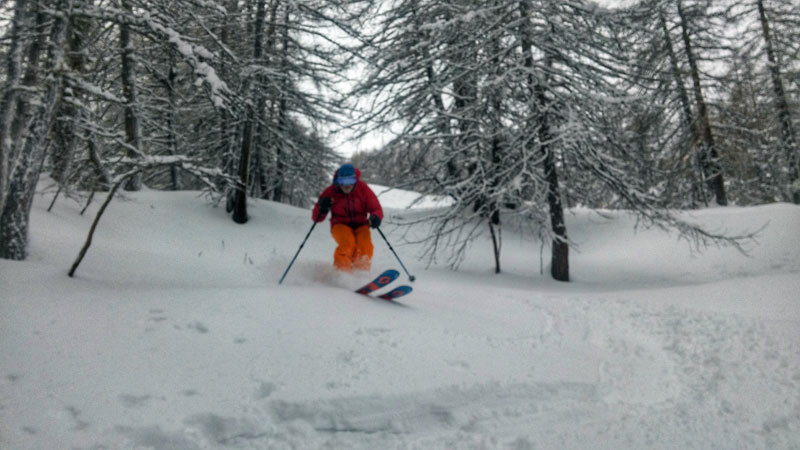 As the Gaultier lift finally started for the first time this season, today, it opened up a good section, including the off-piste down from the Cret drag (which is not yet working), untracked by all the UCPA Swedish powder hounds. It was all of a five minute hike and traverse (above) for a fairly decent descent with a bit of extreme hopping over the odd rock and tree root. It's all looking good, the main three or four forecast sites are all singing from the same hymn sheet with circa 25cms to fall today. 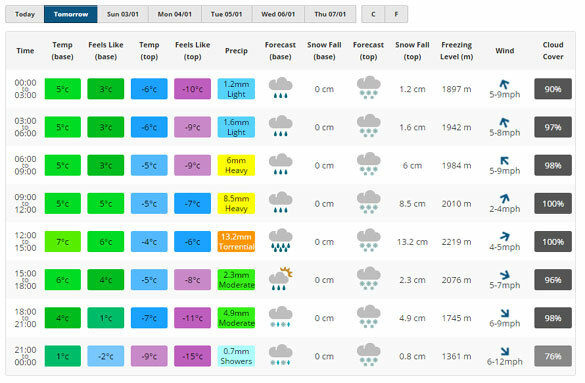 And then the outlook is for further snowfalls, 5-10cm nigh on every day, which is better than getting one big dump. Though the avalanche risk will be very high with this fresh snow, which is settling on to a very weak layer which basically has not bonded to the ground, so it will not take a lot for the new snow to simply slide off. And, yesterday, this was indeed the case! 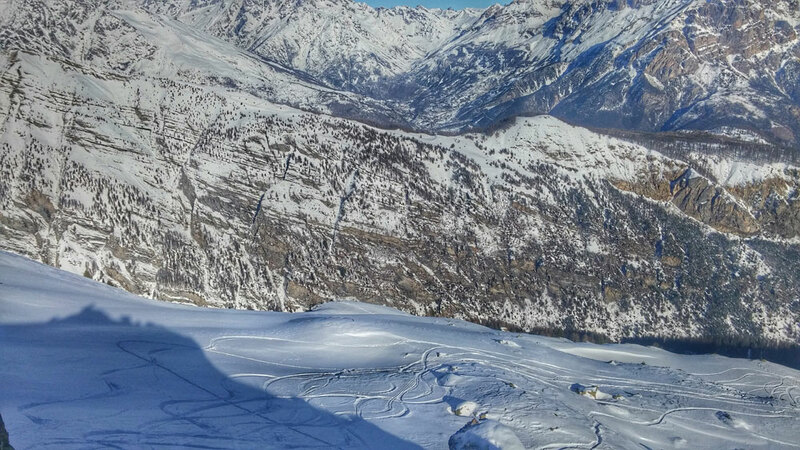 We had made a plan to take advantage of the lifts and then the closure of the Vallons by skinning up the Vallons piste while both the chair and the piste are closed, (though they were working to prepare the piste but still a few days off). My intial plan was to traverse over the Vallons chair but I decided against it after a chat with another guy and it was not as if we had to search out untracked! After a superb descent in fantastic cold powder I bumped into a very experienced instructor who had surprised himself by setting off a slide with his client on what is normally a very 'safe' slope, a classic Heuristic Trap, so now, with conditions like this, it's best to err on the side of caution. Might look sweet but be careful. Who knew there's a right way to shovel snow? Well, we do after an intense hour or two of avy practise with the Club Alpine Francais of Briancon who, after last winter's Haut Alpes tragedies when at least six members of a local CAF died in one avalanche, have had the official nod to start teaching avy rescue techniques to anyone going - or thinking of going - off piste. Although, today up the hill, the uptake wasn't huge (maybe a dozen including snowshoers who, let's face it, are not immune to avalanches) it was a good training session - not only did we practise finding transceivers buried at least 20m away in the snow, but also how to shovel more efficiently, work as a team and victim stabilisation. Prior to that we took the Prorel lift all the way to the top, where the wind was gusting 40mph. It was snowing above 1750 and the viz very low. Yes, winter's here. At last! Avalanche risk is currently 3 which is when most accidents happen but, as we couldn't see the side of the pistes, we weren't about to test the depth or the safety of the snow off piste. But with the recent rain most pistes now have a very good base for the fresh snow fall that started today and looks like lasting till Wednesday. Been up the hill and the weather's ever changing. With Bowie's Ch-ch-ch-ch-changes poignantly playing in our minds, we looped from chair to off the drag half way, through the trees, back to the chair. There was rain in the valley, high winds rocking the chair (top lifts and links closed), snow blowing in our faces and low cloud but, sometimes, a glimpse of sun that lit up the mountain - and made skiing the knee deep powder off piste a hell of a lot easier. For me, anyway. By 14.30 it was a blizzard so we called it a day. Turned and faced the strange. We went up the hill, this morning, with wind and cloud in the valley. And whadya know the sun came out. So apart from having the wrong lenses in our goggles, it was a bonus to have light, although we're still hoping for more of the snow that everyone has forecast. 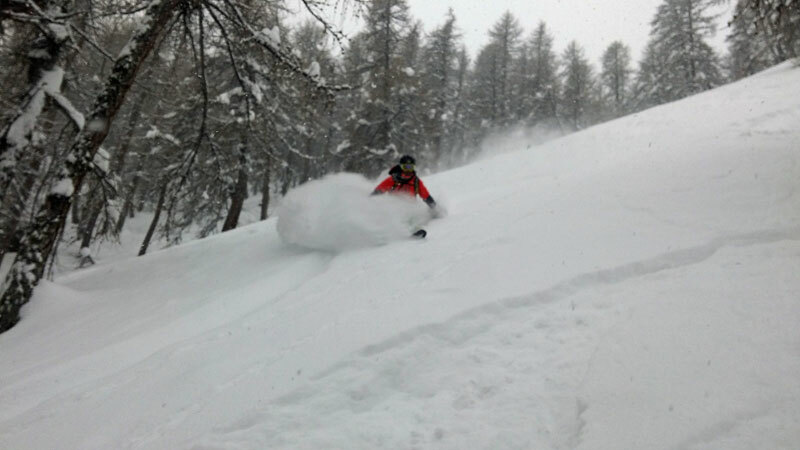 The top lifts are closed owing to avy risk but we had a whole unpisted piste, knee deep in powder to ourselves. Gav looks like he's in Japan (pic below). So it was a case of doing laps, sharing the drag lift with the British army, who were out in force taking a piste for their slalom training. Then it was hot chocolate at the Peyra Juana and down for lunch. It's now clouded over so maybe that snow will come. So, yup, there was wind up there but the Vallons lift was closed for technical reasons so our two hour sess went from up the Barres drag and hanger right to take the top line off piste and through the trees then across to the Frejus village and down to the chair over the untracked terraces. 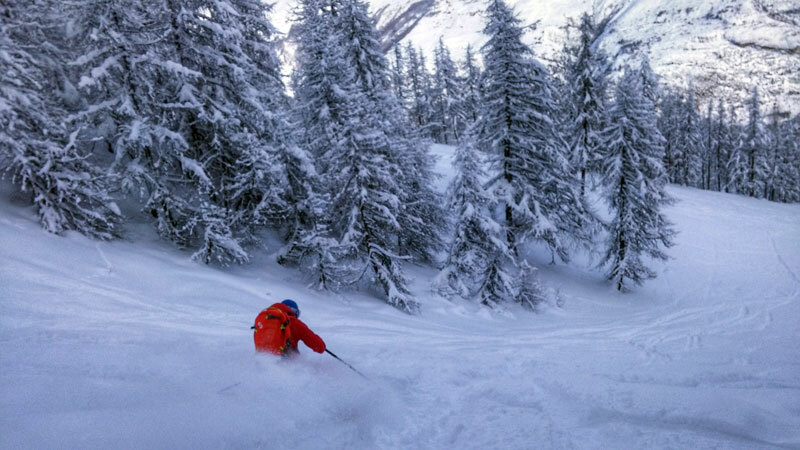 And it was a pretty good way to spend a couple of hours especially as the powder was so deep, light and fluffy. Puking it down in Serre Che. So time for more tree skiing over in Monetier from top of Bacchus but hanger right via Cretes des Lauzieres. Beginning to look even more like Japan (see Ken Reeve in the white room, below). The more snow, the merrier but it's going to add to the instability. 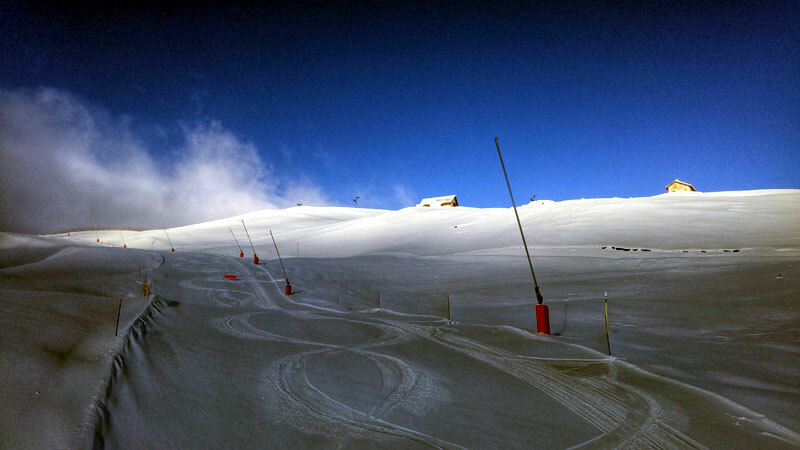 After the avalanche tragedy in Les Deux Alpes, yesterday, there will be questions asked about closed pistes - and the access to them. 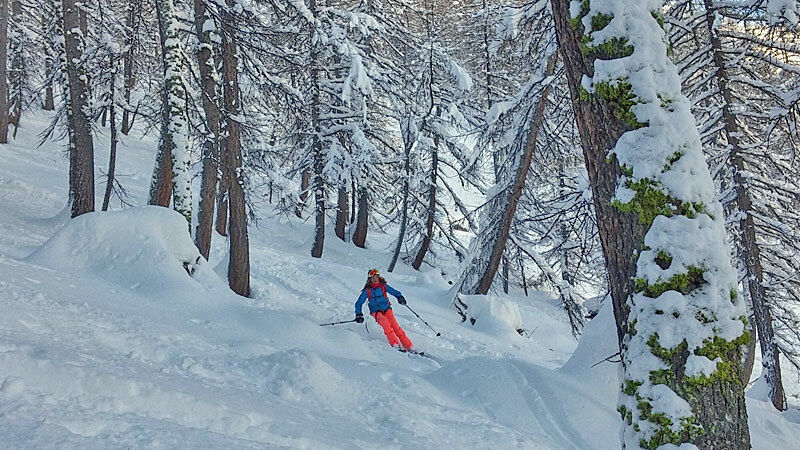 We skied a closed piste in Monetier, a couple of days ago but the big difference is that it was in the trees, with nothing loaded above it. Blue sky and at least 30cms of fresh. Woke up to the sounds of avy blasting up the hill and snow ploughs in the valley. 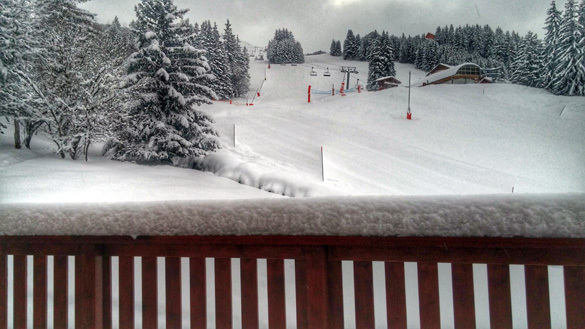 So it was first lifts, this morning. And we discovered a strong gusting wind up the top closing the high exposed lifts. 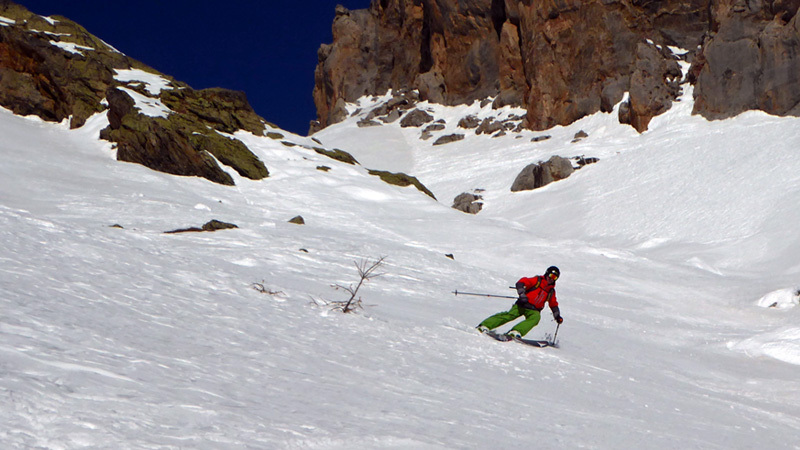 So some of the off-piste was crusty, other areas were sublime. It's -3C at 09.30 with the wind gusting in the valley. 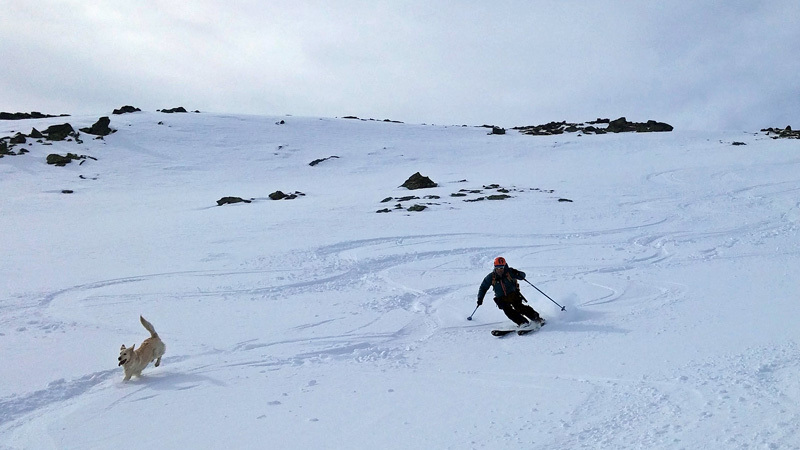 Yesterday, it was blowing a hooley up high so the powder was wind blown and crusty - or deep and sublime! 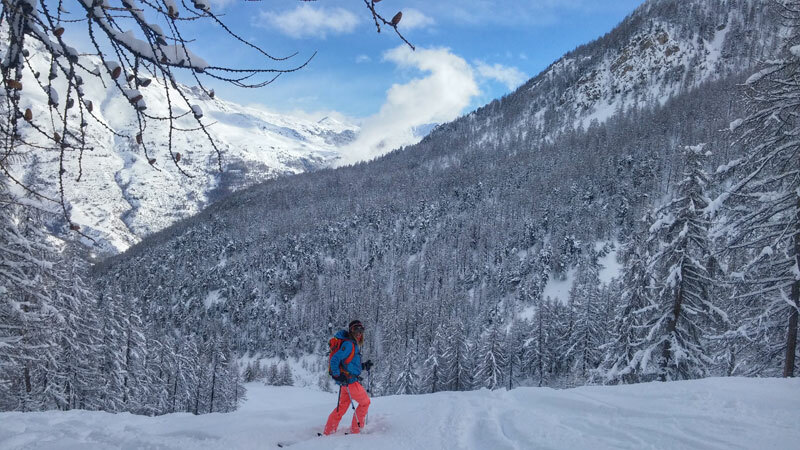 Gav was in the land of tight ski pants and furry hats (and that's just the men), in Meribel where there was no wind and plenty of powder, that the piste poseurs avoided like an Aldi supermarket. So Gav and friends had plenty to shred BUT he forgot his transceiver and the others were not avy savvy with kit so they were limited to safer areas. It's -10.5C at 09.30 and a light breeze in the valley and very cold and overcast. We'd left a cold Serre valley with strong winds and temps -5 but as we drove past La Vachette the temp on the car started to plummet, and by the time we parked up just past Val-des-Prés it was minus 10.5 but, what was quite amazing, they had not had any wind in the valley; the trees were still loaded with snow! 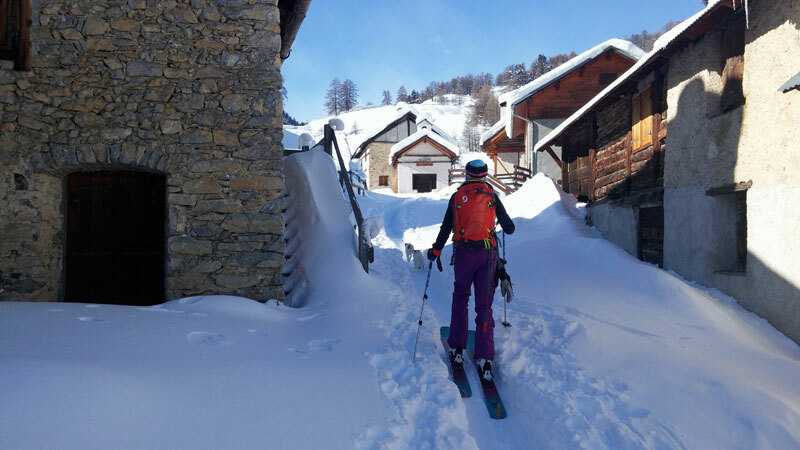 We started the long hike, with the Rando Chiens, skinning up the Granon village on the trail that follows the chemin and then goes through the trees cutting the corners off. 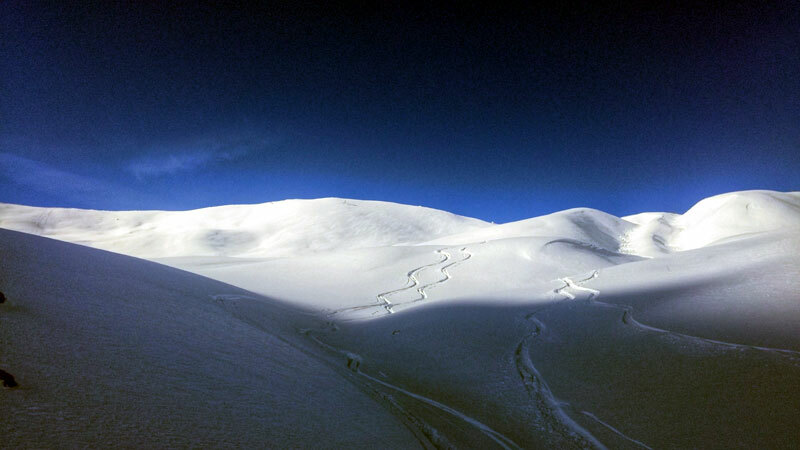 It is a long way to go, but it is a beautiful journey,so much so that it's not just ski tourers but snow shoers, as well. 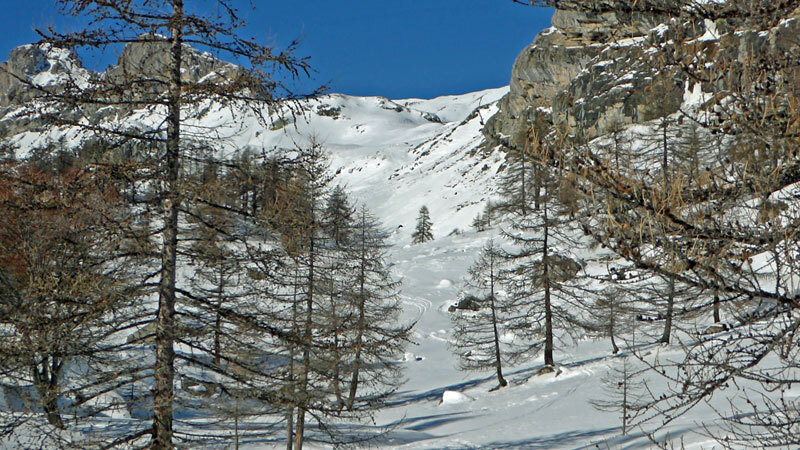 The logic to the tour was that it is safe from avalanches and there was a very good chance of fresh powder (not wind affected) in the trees. 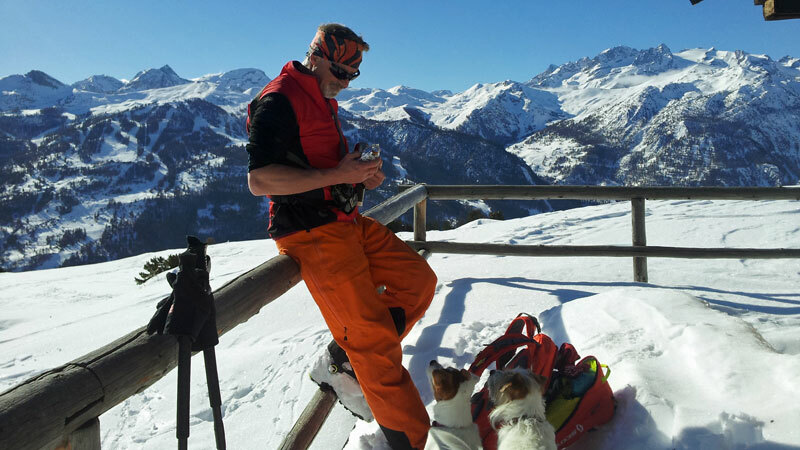 Once in the village, it was time for a break, sharing a snack with the dogs, before the hard part of making fresh tracks in the deep powder up through the Bois de Granon. It was tough going and the Rando Chiens did seem to be tiring in snow that was up to their necks in places - and cold, forming ice balls in their whiskers and paws. When we changed into downhill mode, it became apparent that Beanie was suffering with the fresh snow, freezing under her legs making it hard for her to walk. So I picked her up and brushed her down until she was a little better - and we took it nice and easy. The trees are the most sublime I know, and the pitch is just perfect. 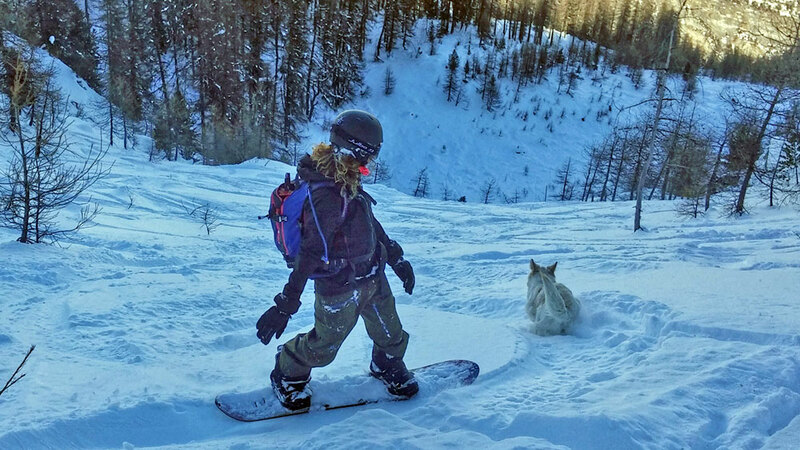 I picked Beanie up at one stage as I traversed to save her legs, but we were a little concerned and decided to ski down to the village to get out of the fresh powder. 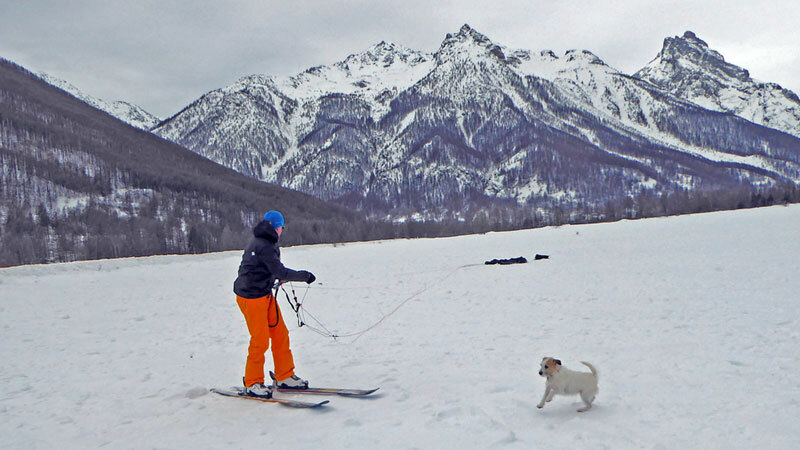 Once on the track down, both dogs hared after us to the van - and were quickly revived, tucking into a saucisson at The Cocoon before home and a dog-tired deep sleep on the sofa. So a fair number of pictures. 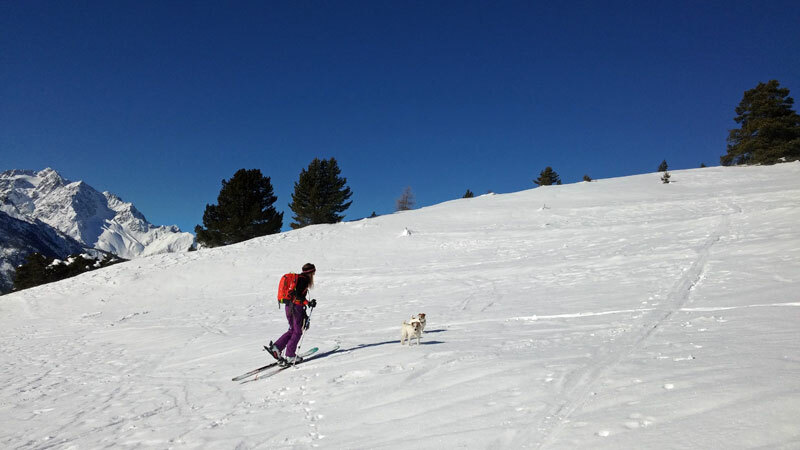 Another white walkies for the Rando Chiens, yesterday, up towards Col du Granon. We did an hour and a half's hike up, passed the village, to a little closed-up chalet to share a snack with the dogs and take the skins off. Sadly, the snow is windblown up there, so more like combat skiing back down through it, then over the terraces between the road bends where it actually became quite spring like. 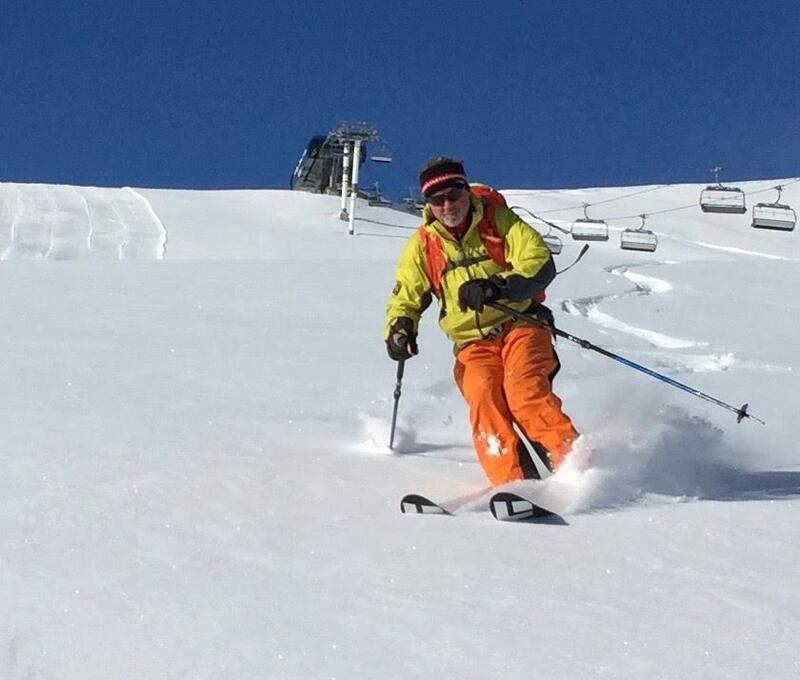 With sunny weather like this for what looks like another week, who knows we might be spring skiing soon! 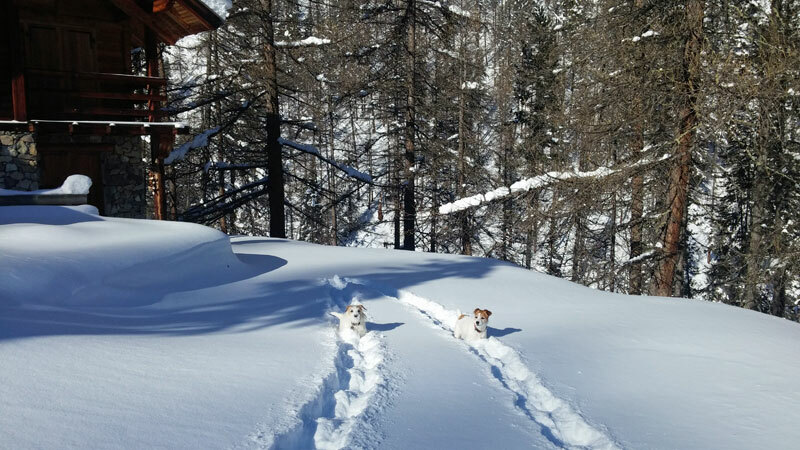 We're stuck in high pressure for a few more days, which is great for the resort and piste riding - not so great for powder hounds. 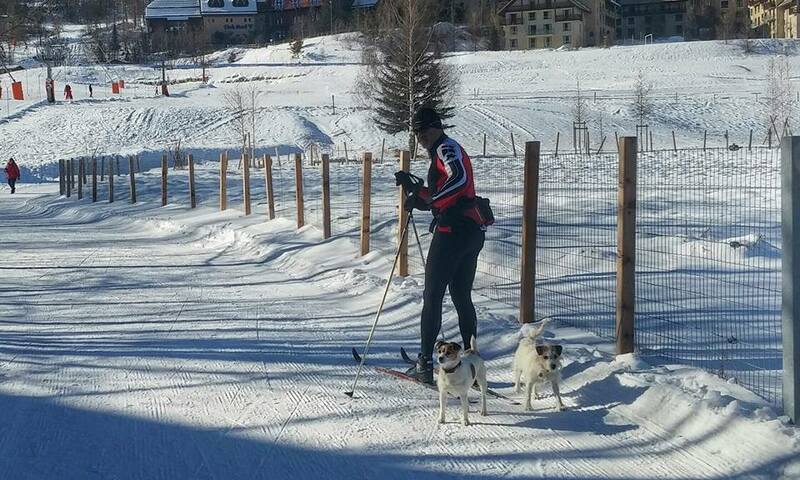 Our hounds, though, are haviing plenty of exercise! 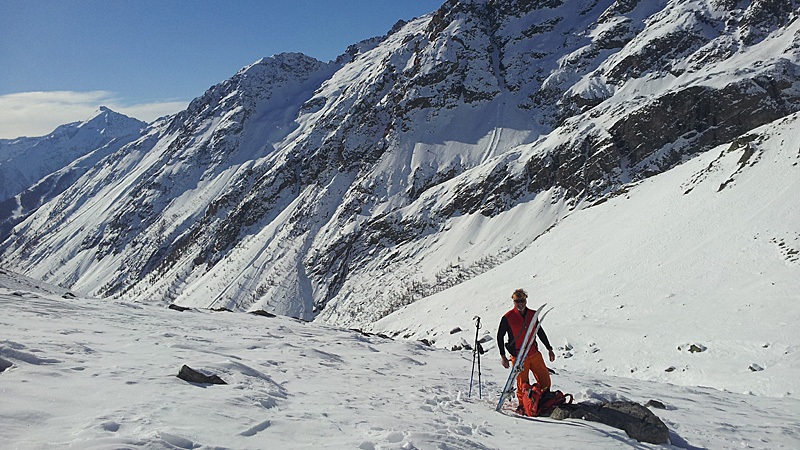 Two ski tours, this week, and a 10K cross country excursion with Gavin, yesterday, to Monetier and back. 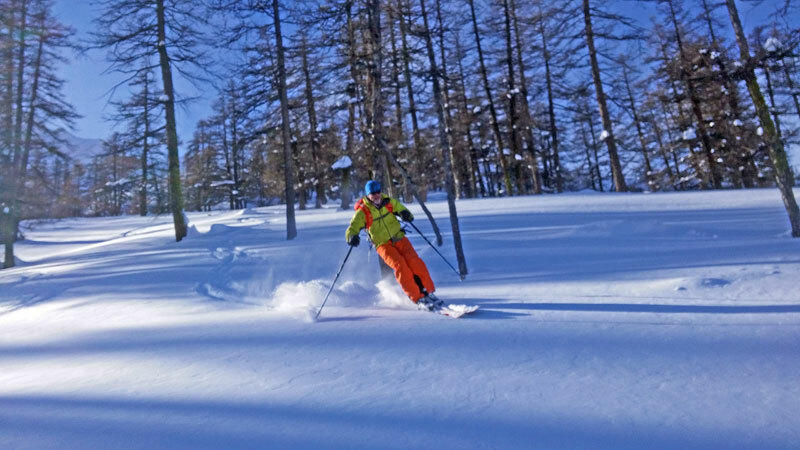 We're members of the local Club Alpine Francais in Briancon and, every now and again, I join them for a sortie (ski tour). So yesterday, Saturday, it was an early start, meeting them at 07:30 in Briancon. It was Jean Louis Kastle the 'group leader', me and two others. I was greatly relieved when the girl, Eloise, got a split board out of her car as that meant there was a good chance I would not be the one at the back! As I had a van, I drove along with Eloise's dog, Belle, a cross between a lab and an Alsation. Just as well I hadn't brought our Rando Chiens. 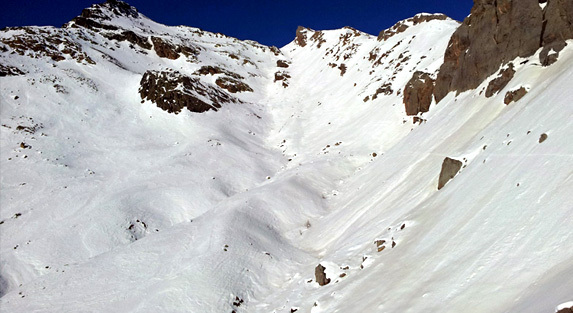 Target was Crête de la Seyte, which is up from l´Argentière-La Bessée accessed from Vallon du Fournel. 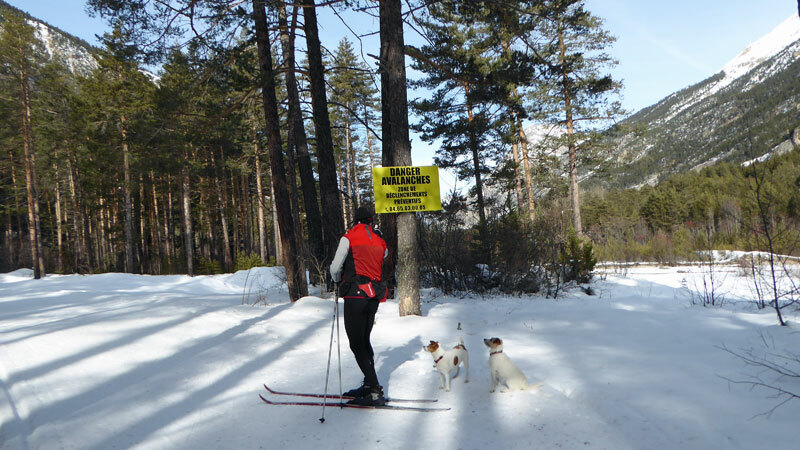 There were a fair number of tracks, as in the current hazardous conditions many ski tourers head to this safer sector. As there were only four of us the pace was quite quick, around 450m per hour. 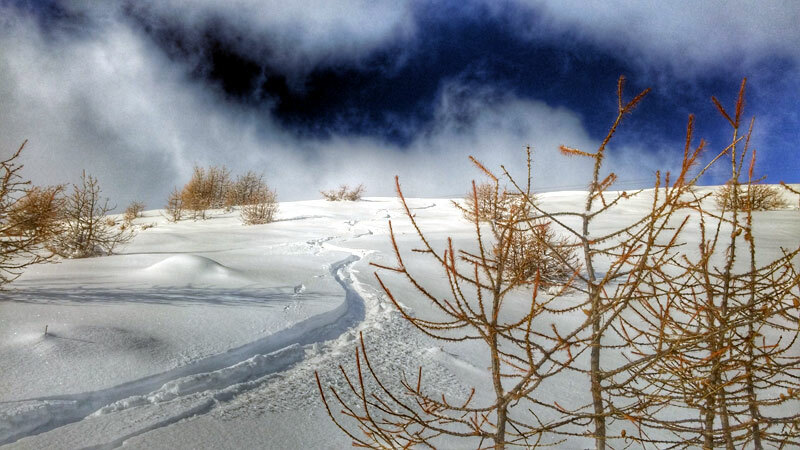 It was most encouraging to find cold powder as we climbed through the trees. As we neared the Crête the climb was a little technical and good skills were required (I was not 100%). 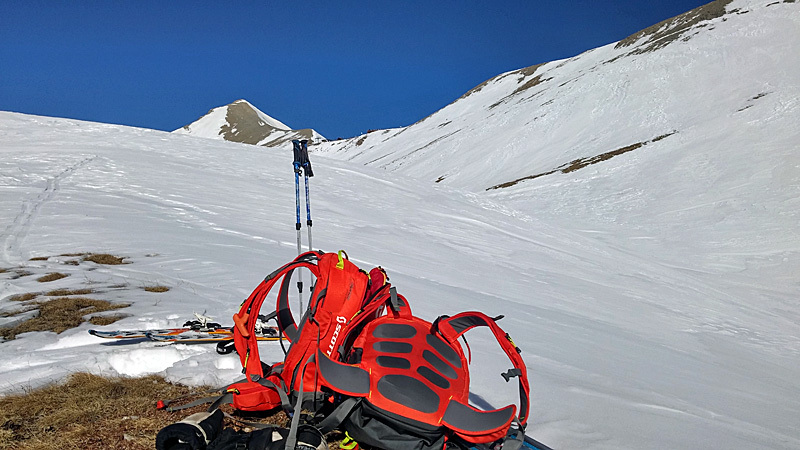 I bootpacked the final 15m and could see the reason that we were not going to continue to the summit and ski off the back down, the more usual line, was that there were some big fractures and evidence of recent slides. 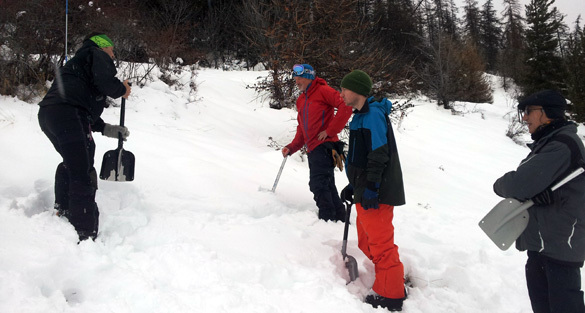 We still found some good powder and almost untracked. Thanks to Jean Louis for showing us the way - and Eloise and Simon for their company. And, of course, Belle, the dog. Yesterday it was T'shirt and shorts in the afternoon as the temperature hit 29C in the direct sunshine and 13.5C in the shade. Rather than go up the hill we did some Back Country Garden training in the field next to where we live! This time of year the sun is not as powerful as in true spring, so even with the warmer temps the melt cycle after the overnight freeze happens much later in the day. So around noon, when in the spring you'd be finishing your ski tour, now the snow is only starting to transform. The aspect of the slope, in how it faces the sun, is also critical to the above process, so a S'ly facing slope will turn sooner than that of a SW facing one. 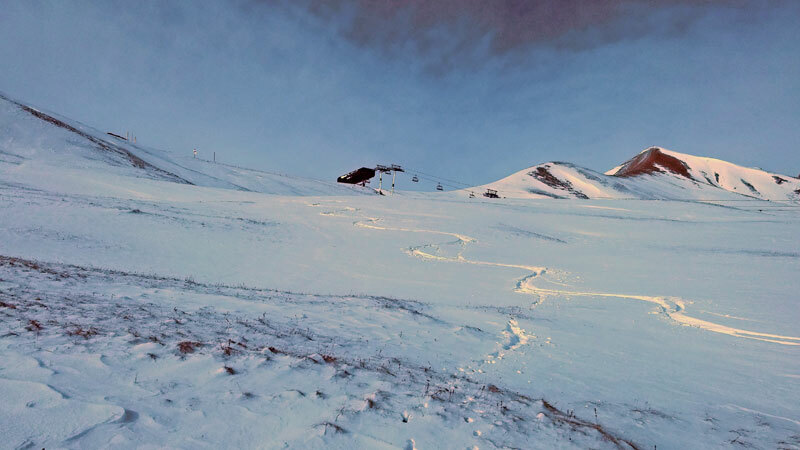 And as the sun is low, the angle of the slope is also important. Once things had warmed up we spent an hour practising kick turns up and down our back garden going up to the trees and then skiing back down still on the skins - all good for the technique! Looks like colder temps return mid to end of the week. FIRST SPRING SKI TOUR - IN JANUARY! He's been like some mad scientist, measuring temperatures, checking the snow in the field next to our apartment. Yep, Gav's got the whiff of spring in the air - and decided that it's time for lift assisted spring touring off the back. And it's only the end of January! We took the lifts up to the top of the Grand Serre chair and looked over the top of the ridge and the south west facing slope. There were, alarmingly, patches of grass. But just a few metres further down, Gavin spotted a route. And so we descended - with transceivers on and airbags primed. 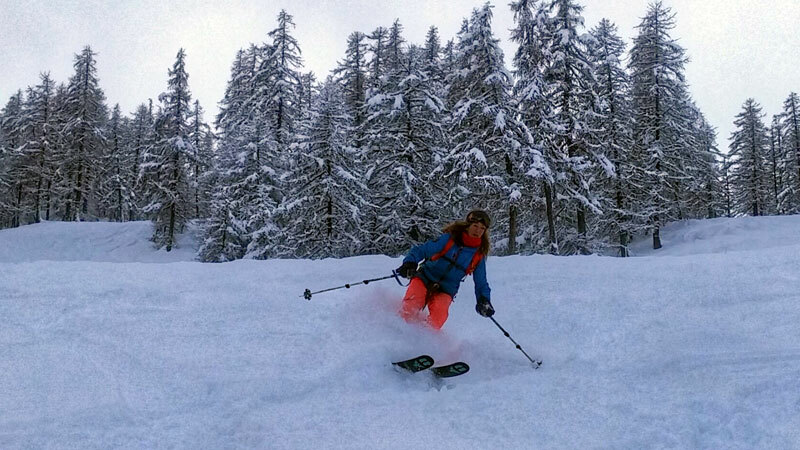 Well, we skied all the way down via Lac Partias to above Les Combes. And the snow? Yes, all the way. What was it like? Yes, we had spring snow. We, also, had wind blown, sastrugi, hard pack, crud and, a bit of powder - sometimes all the above during one run of a dozen turns! 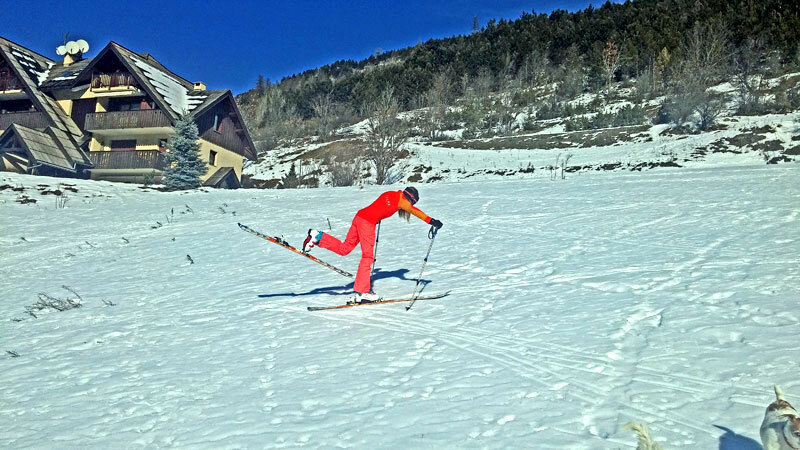 But the sun was shining, the scenery was sensational - and there was the undeniable feeling of oneupmanship taking skins off among the punters back up at the Rocher Blanc chair. Even the lifties give us high fives. Well, the restaurants up the hill have all the deckchairs and tables out - and the tills are ringing. 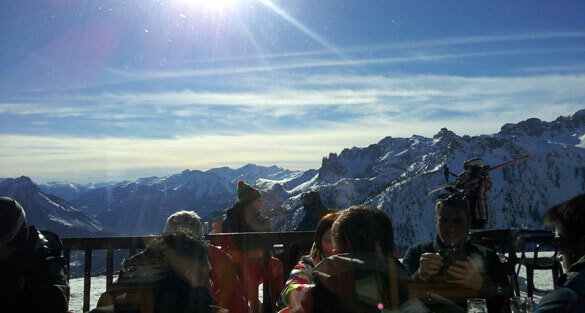 Holiday skiers are enjoying great snow on the pistes, having lunch in the sun and getting tans. BUT the snow is slowly melting and more is needed if we're going to last the season! Meanwhile, if you want a comedy moment - and missed the Altitude Festival in Mayhofen (see our front row review), then watch me going downhill on cross country skis! 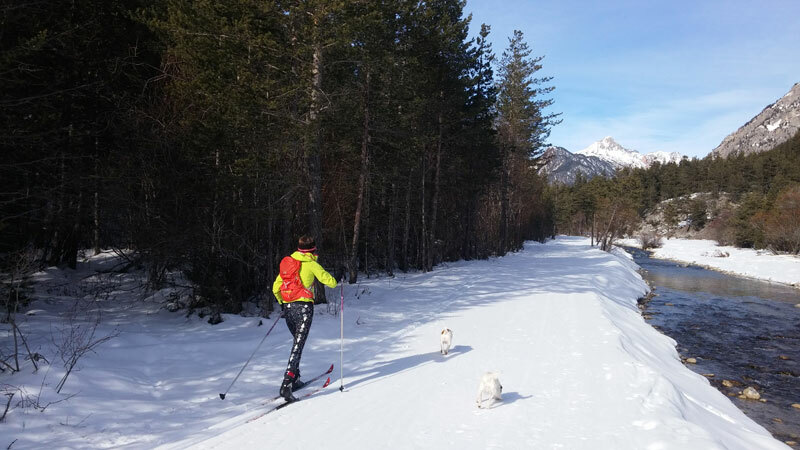 Yesterday, as there was high cloud, we went cross country skiing over in Navache but, as we had the Rando Chiens, we took the less pisted route through the woods by the river. Whoever thought going downhill on long toothpicks, as slippery as banana skins, was a good idea? The scenery was beautiful, though, and it's certainly a good work out over 10K..
Not sure why, but one guy decided to ford the river, barefoot. I think he wanted to run on our side of the river, but not sure if he could with frozen feet! 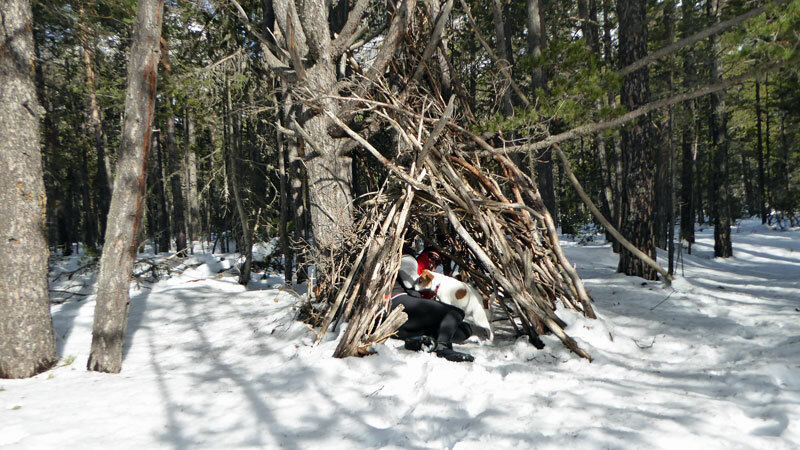 And we even found a basic wigwam for Gav, The Remanent and the Grizzly Jacks. The options are shrinking, like the snow on the south facing slopes. 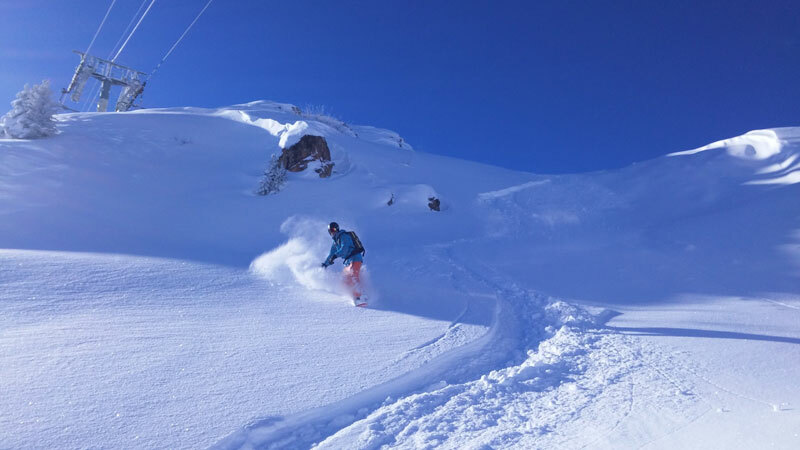 Gav and Ken (below) went over the back of Yret, yesterday, and scored great spring snow but then had boiler plate to skin up on the north west facing slope back to the Cucumelle chairlift because the sun is still too low to soften it. 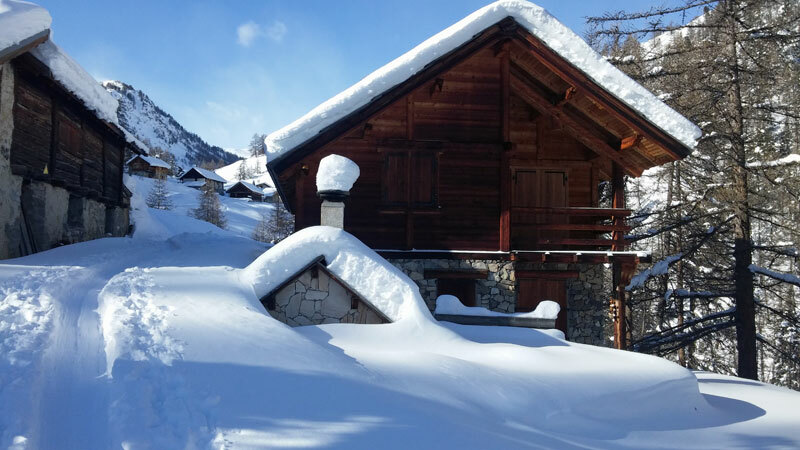 Meanwhile, we know that many of you will be holding off booking a ski or snowboard holiday until seeing what the weather does, checking the different forecasts several times a day. It's a waiting game. 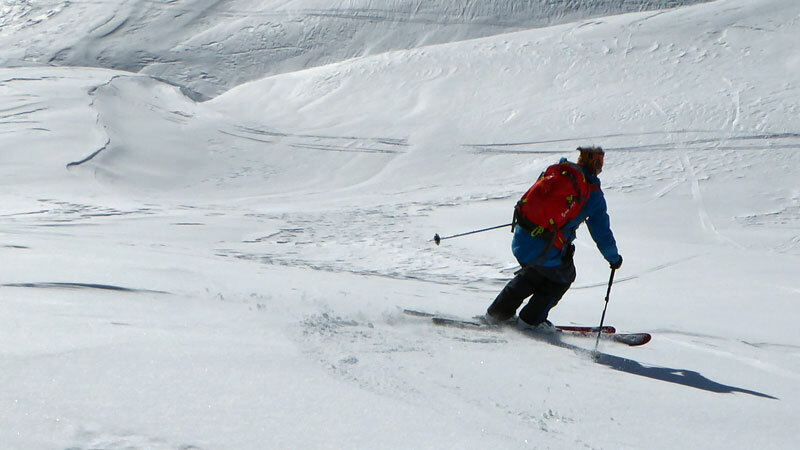 Our contributor, Bing, is a regular weekend warrior powder slayer (see last season's report). He is climbing the walls (literally at an indoor climbing centre) waiting for snow while watching the weather and checking with local guides in order to decide what to do, this February. 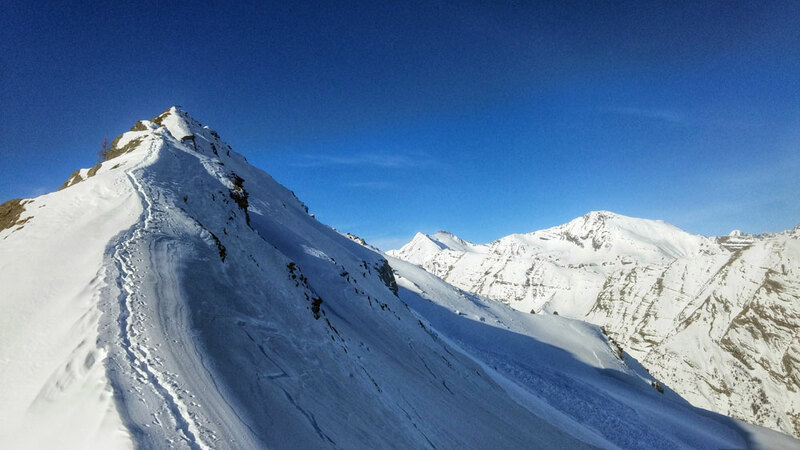 Here's his report on his current predicament planning a weekend of powder. 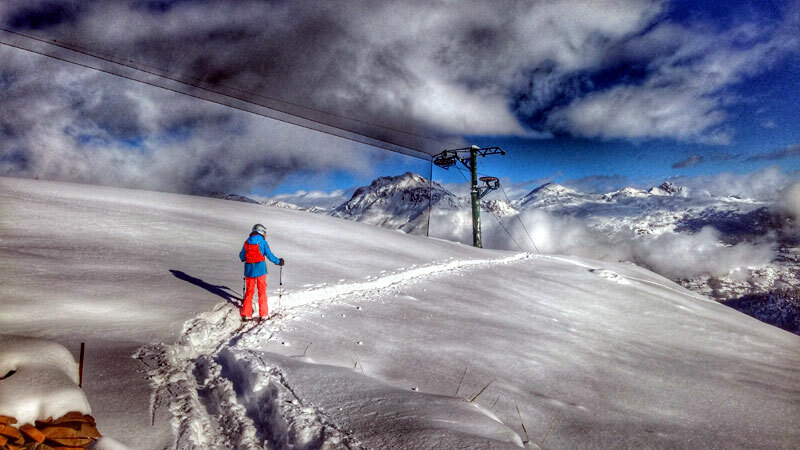 The whole month of February is on standby for a powder ski trip! Mates are getting irritable due to lack of snow, even the 12 day forecast's looking grim! 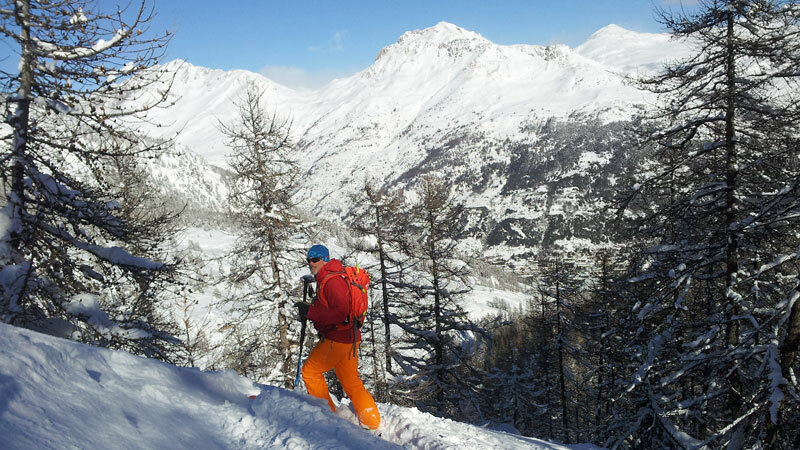 Mauro, our Swiss guide based in Verbier, had been scoring some powder turns until spring sprung. He advises us to wait until the next storm comes through. Mathieu, our French ski guide, is planning a trip to Whistler. Say no more! 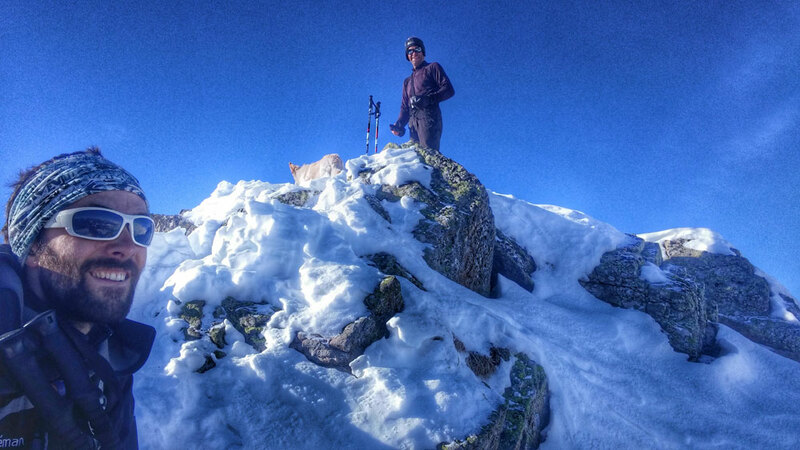 Fabio our Italian based guide is in despair due to lack of snow! 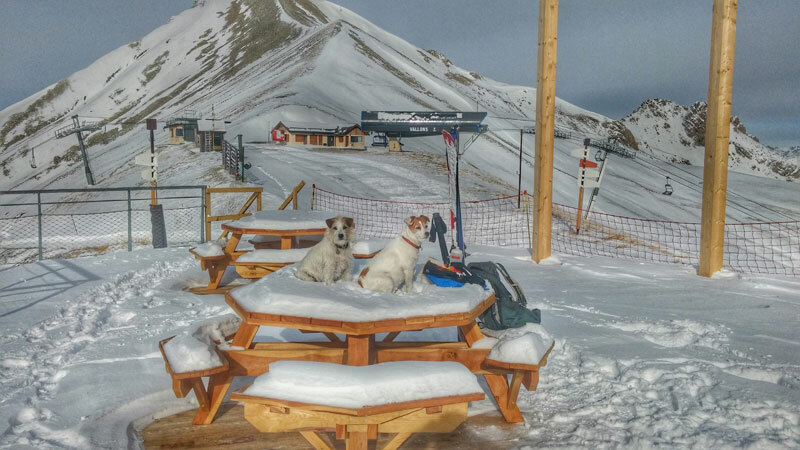 While the sun and warmth have been great for piste skiers and the resorts' restaurants up the hill, having spring this early is not ideal for snow conditions lasting for another two and a half months. 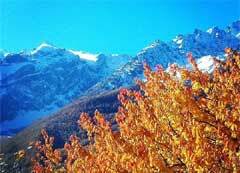 So the weather that's about to hit the Alps, tomorrow, could bring welcome snow to some resorts. But will it be a disappointment to others? Meanwhile, we're still making the most of it. Yesterday, Gav and I did the Ravine Montagnolle, the valley off the back of Yret (below). I was fairly daunted by the thought of the ascent, which Gav said took him and Ken an hour and a half, two days earlier, slipping on boilerplate. But, when we arrived at the Yret chair at 11.30, it was closed for rescue training until 13.00. So we skied down to Monetier and back, had a Coke and, by that time, it was open again at 12.30. In the real spring, this would have been way too late, but as it's still end of January, it was actually perfect. Not only was there pretty amazing spring snow all the way down the valley but, coming up, was a breeze (well, a steep breeze) taking only 39 mins as the snow was softer. We had a quick stop, taking the avy bags off for a snack and water, right in sight of Punter's Platform, the new picnic area at the top of the Vallons lift (just to the right of the top of the ski poles in the pic, below). 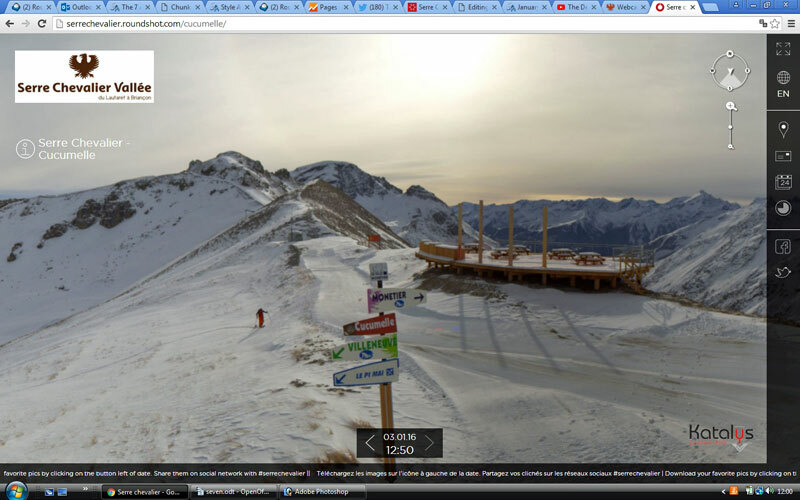 Then a hike over to the Cucumelle chair and a ski down ,back to the van by 14.30. Woke up to around 10cm, this morning, and temps are slowly on the rise (+2.5 at 10:00), so now seeing light sleet which, if it continues, will gradually turn to rain. Looks like a fresh breeze in the valley - and winds at altitude are forecast to be 100kmh, this afternoon. 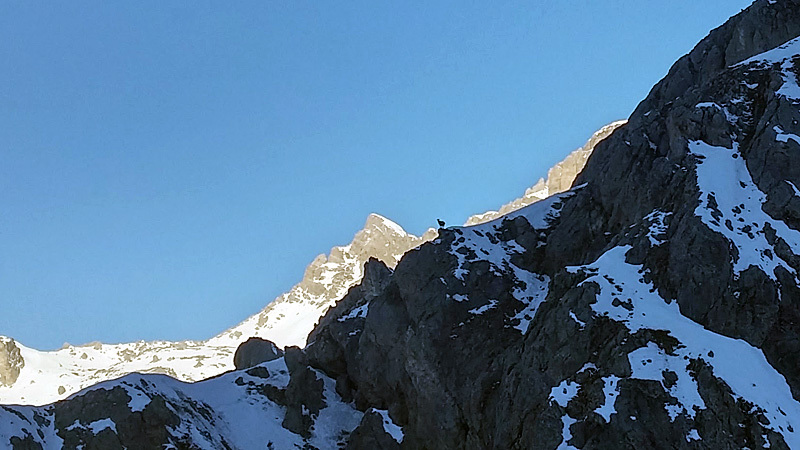 Yesterday, I was up early for a ski tour with Club Alpine Briancon to Crête de la Ponsonnière, 2,824 from Pont de l'Alpe. We encountered every type of snow pack and, as it was a bit cooler than of late, together with hazy cloud and chilly breeze, the snow did not transform much above 2,300m. On the way up, as ever in that area, we were observed by boquetin and chamois.